alaTest hat 65 Testberichte und Kundenbewertungen für Miele Compact C1 Powerline zusammengefasst und analysiert. Im Durchschnitt wurde das Produkt mit 4.8/5 bewertet, verglichen mit einer durchschnittlichen Bewertung von 4.6/5 für andere Produkte. Am positivsten ist den Testern das Design und das Preisleistungsverhältnis aufgefallen. Die Bedienbarkeit wird ebenfalls positiv bewertet. Wir haben sowohl Nutzer- als auch Expertenbewertungen, Produktalter und weitere Faktoren ausgewertet. Im Vergleich zu anderen Produkte erzielt Miele Compact C1 Powerline einen alaScore™ von 89/100 = Sehr gut. 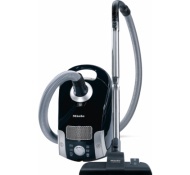 "Best thing I've bought in ages, after getting rid of my old c3 Miele I thought nothing could match it - this one does!" "Fab. For a small hoover super powerful with multiple different settings. Quite loud though!" "A handy and powerful lightweight cleaner. Delivered on time. " "Very pleased with my new cleaner. It is lightweight and very powerful when picking up. I would definitely recommend it." The stair carpet looks new again! "Forget the Dysons. In my experience, the Miele machines win hands up every time for performance - and they're cheaper. This smaller Compact model is ideal if you don't have storage. Works on wooden floors too. " "Great little vacuum, I have two large dogs. Using on carpet & laminate flooring. I've had this just over a week & am very happy with it. Hopefully it stands the test of time." "This hoover packs a punch - so powerful it can clean any carpet. Has multiple settings ready for any hoovering challenge. One thing to note is you need to buy the bags separately. "